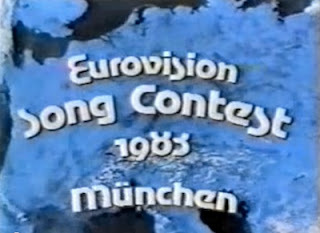 This series makes its comeback with another one of those totally crucial years for me and the ESC. In my native Sweden Carola-fever reigned and there was a bit of hysteria building up for the final in Munich and I have vivid memories of watching the first preview show on SVT. So vivid that I in fact remembered several of the preview clips and even the odd line spoken by the presenter, and when I saw the show again years and years later it was just as I remembered it. Ranking these songs is a very difficult task as I would want to place perhaps ten of them in my top five, but that is not allowed. And it also shows that being disastrously bad can be a quality in its own right. This entry poses the question how much you can possibly fail when devising a Eurovision entry. This one has it all: fake pompous opera singing, outrageous costumes, bits and pieces of famous arias (Bizet could be spinning like a propeller in his grave) and when you think it can't get worse you get a trad jazz breakdown. Everything is so fantastically wrong and it totally deserved the nul points it got in the voting but I also love it. I love it because it is so disastrously bad that it forces me to love it. It wouldn't be right and deeply unfair to place it anywhere but last. Should be right up my alley, this moody and difficult French ballad, but for some reason it just leaves me cold. It's nice, even interesting, but I can't shake the feeling everyone on stage is merely mimicking a French ballad instead of truly performing one. Leaves me stone cold every time. It should have been La Compagnie Creole instead, that would have been a lively start. Another one that leaves me cold is this cheerful little singalong accompanied by a disco beat at a time when disco was not only dead but super dead. I always sort of liked this one and am always surprised not to rank it higher. It's pleasant and harmless but totally lacking in temper. It goes on and on until it's gone and nobody remembered it was ever there. It's not often that Portugal sends in a song as hit friendly as this one and it sounds really good and suited for the airwaves. Unfortunately nothing much happens in it. A bit of a climax would have been nice. One of the big pre-contest favourites in the Swedish papers. I like the verse and I like the chorus but can't shake the feeling they don't belong to the same song. And Mariella's voice does turn a bit harsh at times. This is like a foreshock of the almost manically happy and super-effective schlager Denmark would hammer out at Eurovision for the rest of the 80's. This one gets close but doesn't quite go all the way. Very inoffensive and likeable family entertainment that I loved very dearly as a young boy. I still see its charm but have grown more and more immune. Give me "Mil etter mil" any time instead. This is where the ranking really gets hard. This is a sweet little song, very well performed, but this is a hard top ten to crack. This one falls short due to very heavy competition. The German answer to Simon & Garfunkel deliver their song with style and conviction and it is a most likeable ballad. But it would have been even better had Mary Roos agreed to sing it, like she was originally supposed to. Another very fine song in a delicate arrangement. One I enjoy listening to at anytime without manifesting itself as a breakout favourite. I like everything about it but would possibly have left out that screechy saxophone break in the live version. How much can go wrong when you put together a group of people to sing and dance together? Westend comes close. Only one of the boys can dance and only Gary Lux can sing, and the others just fill out the numbers. But for some inexplicable reason this one works and I'm very fond of it. Have there ever been happier backing vocalists than these ones? I can't think of any. Who would that be? Who could not break into a wide smile when watching this? If the song had been slightly less obviously stolen from Shakin Stevens it would be even further up my list. Like many other UK entries in the 1980's this isn't highly original but it's so terrifically performed and so violently catchy that it is hard to resist. Every time they flip those chairs over I feel I want to do that too. Främling stranded in sixth place on my list only goes out to show what a strong year this is. A very good song indeed with a flawless performance by a future winner. Class. One of the most elegant entries Finland ever sent to Eurovision. I love the drama, the long intro, the key change and the way they don't overuse the chorus. It's a great chorus but you only get to hear it twice and when the song ends you want to hear it again. Not a bad idea for pop music in general. Ofra Haza had that fantastic way of doing something I always admire: perform and make it seem easy. Excellent singing, excellent presence and a touch of typically Israeli choreography. Very good. The 1980's were not a great time for anyone interested in breaking out of the ESC formula and that was never better illustrated than when this exciting and sensual masterpiece didn't get a single point and was left in a last place shared with the complete meltdown that is Turkey's "Opera". In consistency with the no originality-approach of the times, this one really should have been left with a big fat zero too. One of the boldest and more unique entries ever with it's hysterical beat and intense brass, and just one nonsense phrase repeated over and over again. Being original is fine and all that but in my world you can't argue with an excellent ballad in French of the kind they simply don't write anymore. Pure class from the first note to the last and a most deserved winner.